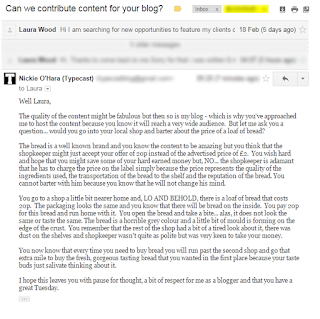 I try to balance the content of this blog with content that is worth reading. Any article that I have been paid to produce or publish is clearly disclosed and is only commissioned if relevant to the theme of this blog. I would say that approximately only 1 in 20 posts have any type of promotional material in them. A huge bone of contention with bloggers is having the placement of 'sponsored content' undervalued after we have worked hard to build an audience and continuously engage with them *whispers* some of us have been at this for years. Therefore, if an agent is approaching any blogger they must believe that they are going to add value to the reach of the proposed article/embedded links. The quality of the content might be fabulous but then so is my blog - which is why you've approached me to host the content because you know it will reach a very wide audience. But let me ask you a question... would you go into your local shop and barter about the price of a loaf of bread? The bread is a well known brand and you know the content to be amazing but you think that the shopkeeper might just accept your offer of ​20p instead of the advertised price of £2. You wish hard and hope that you might save some of your hard earned money but, NO... the shopkeeper is adamant that he has to charge the price on the label simply because the price represents the quality of the ingredients used, the transportation of the bread to the shelf and the reputation of the bread. You cannot barter with him because you know that he will not change his mind. You go to a shop a little bit nearer home and, LO AND BEHOLD, there is a loaf of bread that costs 20p. The packaging looks the same and you know that there will be bread on the inside. You pay 20p for this bread and run home with it. You open the bread and take a bite... alas, it does not look the same or taste the same. The bread is a horrible grey colour and a little bit of mould is forming on the edge of the crust. You remember that the rest of the shop had a bit of a tired look about it, there was dust on the shelves and shopkeeper wasn't quite as polite but was very keen to take your money. You now know that every time you need to buy bread you will run past the second shop and go that extra mile to buy the fresh, gorgeous tasting bread that you wanted in the first place because your taste buds just salivate thinking about it. 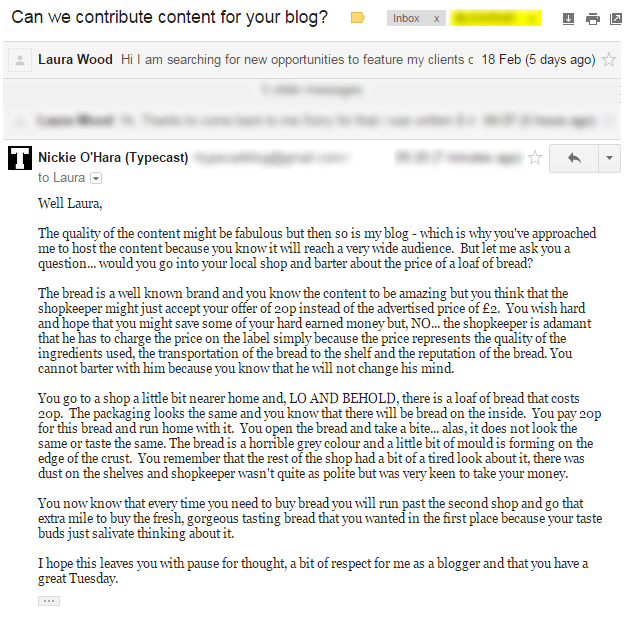 I hope this leaves you with pause for thought, a bit of respect for me as a blogger and that you have a great Tuesday. Just think... she could have got all that creativity at a very reasonable price for her client! This is an old discussion that continues to be examined. Don't get me wrong, I have worked with, and will continue to work with, amazing brands and agents and who know how to form a partnership with bloggers because they are completely on board with how influential they can be. What value you put on your work is up to you but I urge all bloggers to ensure they are being paid what they are worth.